Of course Genoa was the best team in the field and of course we had a ball possession far over 50%, but our red and blue players had again big problems to create chances to score. In the first half only Palacio and Merkel were close to score a goal and we have to be afraid that players like Pratto and Caracciolo are just good headers but technically and especially physicly not good enough to play in Serie A. All Genoa-supporters are looking forward to the debut of Zé Eduardo and the tranfermarket in January, because we now only have 1 real striker: Rodrigo Palacio who gets more frustated every week and booked his 4th yellow card against Cesena, so we have to miss him Friday against Milan. In the second half Moretti made a stupid foul against Bogdani and the penalty was realized by Adrian Mutu, who also scored the fantastic second goal of Cesena. Maybe we have to buy this Romanian player in the winterbreak ? After a very hard match Genoa is now 7th in the standings with 15 points in 10 matches. Miguel Veloso scored the only goal in the 86th minute, while Genoa already played the whole second half with 10 players because of the red card of Antonelli just before halftime. Now the disqualification of 4 matches of Kaladze is finally over. At Thursday Genoa beat Bari in the 4th round of Coppa Italia. Valter Birsa opened the score in the 1st half with a penalty, but within a minute Bari scored the equalizer. In the 90th minute Jorquera finally scored 2-1 and the match seemed over but again 1 minute later Bari scored and we had to play 30 minutes extra. In the 114th minute Lucas Pratto headed 3-2 behind the goalkeeper of Bari and this time the team of Puglia did not score anymore: Genoa qualified for the 1/8th finals against Inter in San Siro. But first we have to play Sunday at the synthetic field of Cesena. Two weeks after the horrible flood that killed 6 people, the team of Mr. Malesani returns in the field in the flood-district Marassi. 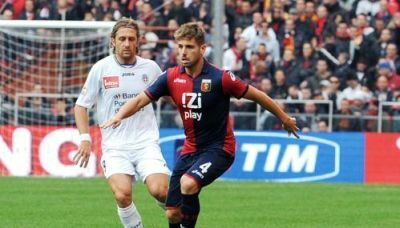 Genoa plays at home against the promoted team of Novara. Mr. Malesani selected the following 20 players: 23 Antonelli,10 Birsa, 99 Caracciolo, 27 Constant, 3 Dainelli, 1 Frey, 5 Granqvist, 11 Jankovic, 19 Jorquera, 33 Kucka, 22 Lupatelli, 52 Merkel, 20 Mesto, 24 Moretti, 8 Palacio, 2 Pratto, 7 Rossi, 31 Sampirisi, 14 Seymour, 4 Veloso. Genoa still misses Kaladze (banned for 4 matches, this is the last one) and Zé Eduardo (maybe he can make his debut at the end of the month). 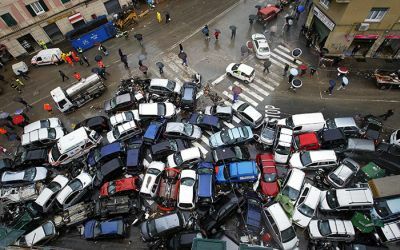 The flood in Genova killed 6 people, all women and children. Of course the match Genoa-Inter was cancelled but the 7 members of Genoa Club Amsterdam already had booked the flight to Malpensa months before, so we decided to fly tot Italy and stay in Milano. We also wanted to visit our member of honour Luca Carini and his wife Federica because of the birth of little Olivia, but the authorities closed the complete city of Genova. Olivia has to wait for her presents from Holland till the beginning of February as we return to see her and Genoa-Lazio. We hope that in February also the people of Genova that live in the Marassi-district can think again about football.